As fruit is cut or eaten, the children record changes in the contour lines. For ages 6 to 13. Plan 1 to 2 sessions. Cut papers into 6-inch squares, planning four for each child. Set out pencils, markers, papers and fruit. One piece of fruit for every two children works well. If a knife is needed, it should only be used by an adult and must be kept in a safe place. Explain to the children that they will be drawing the changes which occur in the shape of fruit as it is cut or eaten. Hold up a piece of fruit and use your finger to trace a line around it's outside edge. Explain that this line is called a contour line and defines the shape of the fruit. Sometimes shape is not enough information to tell us what the object is. A round shape might be a ball or even a moon, but once a stem is added it becomes an orange. The inside lines that help us recognize an object are called defining lines. Place each piece of fruit on a white paper to help make the contour lines easier to follow. Distribute one piece of fruit to every two children. Give each child a pencil and four squares of paper. Ask the children to look at their fruit carefully. Using their first piece of paper, they should draw the contour lines of their fruit and include any necessary defining lines. Be sure not to move the fruit until everyone in the group has finished their drawings. Set the completed drawings aside. Explain that biting or cutting the fruit will change its contour line. Decide whether the fruit will be cut or eaten. If eaten, each group will need a designated "eater." If you choose to cut the fruit in half, you will only need one of the halves for drawing. Set the other half aside. If you choose for the fruit to be eaten, have the designated eater take a large bite out of the fruit. Point out how the shape of the fruit has changed. Using their second piece of paper, have the children draw the contour lines and defining lines of the new shapes. Cut the fruit in half again, leaving one quarter to be drawn. If eating, have the designated eater consume most, but not all, of the fruit. Using their third piece of paper, have the children draw the contour lines and defining lines of the new shapes. Cut the fruit in half again, leaving one eighth to be drawn. Have the designated eater finish the remainder of the fruit, leaving only the inedible parts. 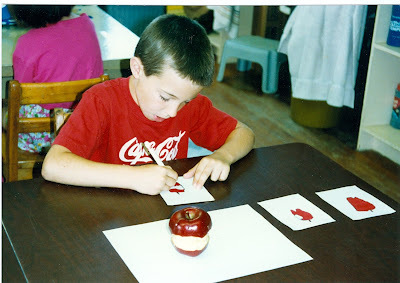 Using their fourth piece of paper, have the children draw the contour lines of the pieces of fruit or the inedible parts left behind, such as an apple core or banana peel. When they are finished drawing all four shapes, have the children go over the pencil lines with black permanent markers. Give the children watercolor markers for coloring in their shapes. Explain that they should keep their colors basic and simple so that the primary emphasis remains on the changing shapes. The children have so much fun with this project that they lose any inhibitions in their drawing abilities. Make sure the children in each group are finished their drawings before moving the fruit or changing its shape. If the fruit tends to roll to the side, place a piece of adhesive putty against the back of the fruit to support it in an upright position. At the end of the class, I invite the children who were not designated eaters to share some extra fruit or the leftover cut pieces of fruit. Don’t be afraid to experiment with other foods, such as a hard-boiled egg or a bell pepper. Anything that shows a change of shape as it is eaten and has some inedible parts for the last drawing will work well. For a striking display, mount the four pictures in sequential order. Discuss the changes in the contour lines as each fruit was eaten. Ask the children to point out any defining lines that identify the fruit. We both like kiwis and can't agree on who should eat it. Our orange keeps rolling over so we can’t see the inside. She moved the fruit and I’m not finished drawing it. He took too small of a bite so it doesn't look very different. Do I have to draw all the pieces of the peel? I’m ready to color my drawings. There will be extra fruit at the end of the class for those who are not designated "eaters." If you are having trouble seeing your fruit, I'll prop it up for you. Be sure everyone in your group has completed their drawings before you move the fruit. It helps to take large bites from the fruit so that everyone can see the changes in the shapes. You need to draw what you see. Before you color the drawings of your fruit, you need to go over the pencil lines with black permanent markers.